You may recall that, prior to having a reality check; I had grand plans for a new model railway. My plans have downsized somewhat since then and a mini-project is budding, if still someway from blooming. Despite that, one potential large project that is on the “possibly might do in the distant future” list is a 00 scale version of Guildford. You may also recall one of the reasons behind this was that although it was a London and South Western Railway (LSWR) station and depot, all three of the constituent companies of Southern Railway connected here – the South East and Chatham (SECR) and London and Brighton South Coast (LBSCR) railways. This meant I could potentially get away with using most southern railway prototypes, including those from the pre-grouping period. On the whole, even with the formation of Southern Railway in 1923, the old machines generally stayed on their old haunts (although there were some exceptions.) Click here for a recap on some Southern Inspiration. Guildford was an interesting place in steam days. It had a fairly rare (for the UK) half-roundhouse depot with plenty of locomotives. It was electrified too, so had its fair share of EMU’s. The really great thing from a modelling point of view was that the engine shed was set into a cliff embankment – an ideal back-scene! Although my own Guildford model railway project is looking extremely unlikely, I still was interested when I found out that a 00 scale model of Guildford in Southern Railway days had already been built. Whilst on a shopping trip with my better half, I successfully avoided the packed shops for a short while to see the model railway for myself. It is located in Guildford Museum, which is free to enter. The model is, as you would imagine, rather large! Built by a team under the direction of John Boas, the layout gives a good impression of what Guildford would have looked like. 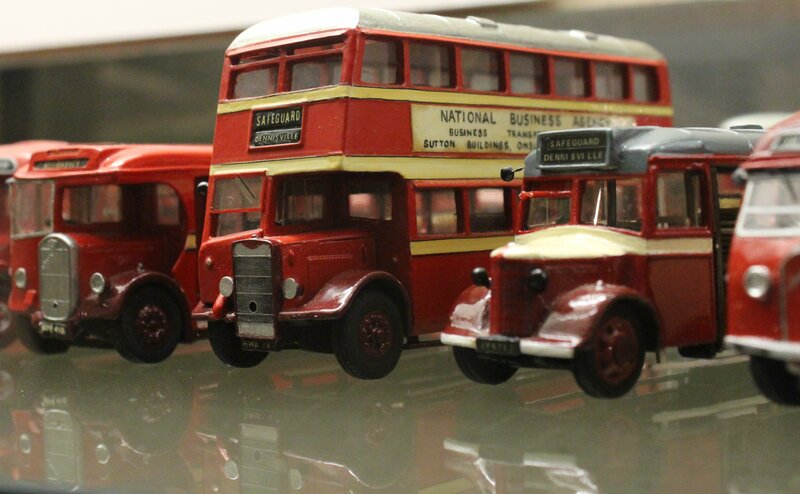 Of note in the museum is a collection of hand built bus models by the late John Sutton. I have no expertise in buses whatsoever, but I can appreciate the skill that would have gone in to create the models. For bus enthusiasts, this is a must-see, but even for lay people like me, they are very impressive and worth a look. Hi, thanks for the comment. I’ll certainly bear it in mind!